Old time music formed into distinct paths of blues, country, jazz, and gospel music between 1900 and 1930. We will play and sing some of the foundation songs, mostly because they are great songs that are simple to learn. As a bonus, each of these songs carries interesting stories about how roots music grew into its current expressions. These songs also reveal a good deal about the social conditions they grew out of. We will spend time with songs from the Carter Family, Jimmie Rogers, Leadbelly, Louis Armstrong, Jelly Roll Morton, Pink Anderson and others. You don’t need a whole lot of technique coming in but we will explore how to play simple songs with conviction, so they feel authentic. Learn to use your voice, your instrument(s) and the other players to build a groove with this very cool music. You need to be able to change chords fluidly in two or three keys, and to sing while you are doing it. All instruments are welcome. The course is about building a feeling in a simple song. There won’t be much fancy technique instruction. George loves how music brings people together. And he loves getting people playing well together in jams, casual settings and performing groups. George has been a member of two music trios with good grooves (Blue Rambler and JPG) that played lots of old time blues, country and early jazz. He likes performing small concerts, coffee houses and fundraising events where the audience is keen to get engaged and happy to sing. 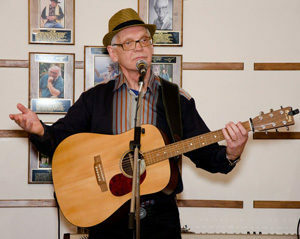 George grew up in a family that sang old songs and has always been attracted to roots music. He likes the authentic feel of these songs and he is thankful that lots of them have simple structures and so are fairly easy to play and are great to sing. He plays guitar, harmonica and ukulele (in order of skill). George has been teaching adults to work in collaboration his whole career. His courses have lots of engagement, laughter and productive fun. His music workshops have the same elements without the work stress. George is a long-time FAMI participant and volunteer.